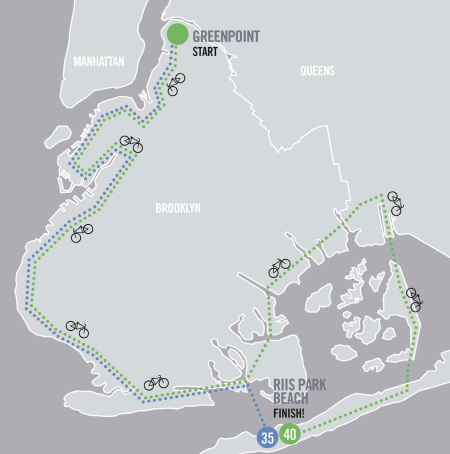 The Brooklyn Waterfront Epic Ride offers 25 and 40 mile routes that explore Brooklyn’s waterfront from Greenpoint to Riis Park Beach. Ride along Brooklyn’s waterfront from Greenpoint to Riis Park Beach! Discover hidden and far flung neighborhoods, pedal through city, state and national parks and take in spectacular bridge and city views along the Brooklyn Waterfront and Jamaica Bay Greenways. Continue the fun at The Epic After Party at the Riis Beach Bazaar with bands, food, drinks and take a dip in the sea! Riders will be fully supported by experienced marshals and mechanics along the route and refreshments will be offered at scenic rest stops. Complimentary bike valet will be offered at the finish line. By participating in The Epic Ride, you are supporting Brooklyn Greenway Initiative, the non-profit organization committed to the establishment, development and long-term stewardship of the Brooklyn Waterfront Greenway. When complete, this 14-mile landscaped route for pedestrians and cyclists will connect neighborhood parks and open spaces from Greenpoint to Bay Ridge. NYCBikeMaps.com makes no guarantees that the bike routes listed will be suitable for all cyclists. View Legend for more details.